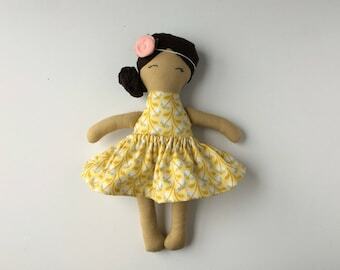 Cloth dolls with simple features and twirly design. 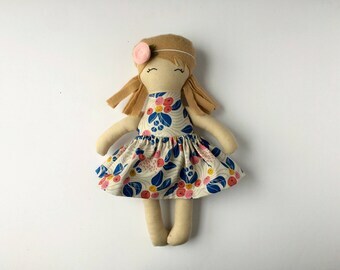 Announcement Are you looking for an heirloom quality, beautifully crafted cloth doll? One that can adorn the shelves of a room, accompany a child through worlds of play, and yet still stand the wear and tear to be passed down to the next generation? Do you swoon over vintage fashion and feminine design for little girls? Let us help you curate your simple yet beautiful toy collection for your little one. We'd be honored. Each doll is sewn from an original pattern, all eyes are hand embroidered, and each one carefully triple stitched to reinforce her for hours and hours of play! 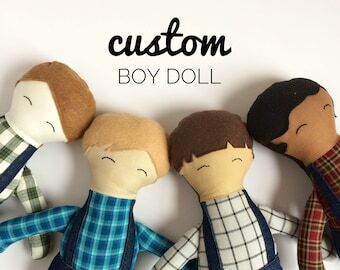 Are you looking for an heirloom quality, beautifully crafted cloth doll? One that can adorn the shelves of a room, accompany a child through worlds of play, and yet still stand the wear and tear to be passed down to the next generation? Do you swoon over vintage fashion and feminine design for little girls? Let us help you curate your simple yet beautiful toy collection for your little one. We'd be honored. Gorgeous doll and this shop was so great to work with. Can’t wait to give it to my niece for her first birthday. This will be a great keepsake! I just love this doll. It is actually a gift for my mother who will be 90 years old this year. I know she will treasure it! The embroidery is beautiful and the craftsmanship is excellent! These keepsakes are not just for littles, but for Great-Grandmothers as well! A sneak peek color palette. A size comparison of both ladies. The very last Christmas order ladies! All born in China, my girls and their beloved Chinese Aunt are the three heads of the logo. This is a tribute to her. My oldest daughter helped design the open criss cross back of each doll since she owns dresses with a familiar look. My daughters and their topknot wearing/twirly personalities were my inspiration for the logo name. The evolution of a Topknot Twirl doll. The first three dolls were made for my daughter each year as my craft improved. Nothing like a good ole cereal box template. My favorite material to use for sturdy tracing. Video summary: The birth of a fabric doll. 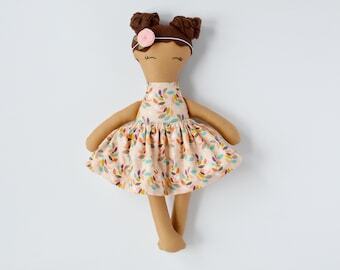 Handmade cloth dolls with simple features and twirly design. I have always enjoyed being crafty with a purpose - something that would be used right away or treasured for years to come. When I had my first daughter, I made a doll for her (thanks to the Black Apple Doll template!) to resemble how she looked at that age. It soon became a tradition, and when she turned 2, then 3, then 4, she got a new doll and each one was more perfected and made with better construction as I improved my skill. I enjoyed continuing the tradition with my second daughter and all the little soon to be one year olds in our play group using old onesies that they used to wear as the fabric. My favorite part about creating each doll was how each one had a different look about them, from hair color and style to skin color and clothing design. With a desire to reach a bigger market than just my family or gift giving to friends, I set out to create my own template so many more little girls could have a personalized doll for their collection. Topknot Twirl was born out of an inspiration from my daughters as well as a tribute to the life where their childhood began. They were both born in China, and their dearly loved Chinese Aunt (“Ayi”) is the center head in the Topknot Twirl logo. My first eight years of marriage were in Shenyang, China as well as my first four years of motherhood. Now with a four year old, two year old, and one on the way, I'm excited to have my first years with a small business to be in my home country!